Here is a guide on how to raise backyard ducks for eggs. Raising ducks is entertaining, exciting and fun. The unique creatures are similar to chicken with vast difference in behavior, eggs are full of nutrients, rich in protein. It is important to know how to keep them on a farm. The persons should provide shelter, clean water and food. Space might determine the type of ducks to keep. Small ducks are miniature crested, Black East Indian, Elizabeth and Silver Appleyard ducks. Do you know that duck make good pets? They are resourceful, quiet, good foragers can eat a variety of food. They have addictive personalities, unique individual identities. The gentile birds sometimes exhibit nervous or calm behavior. They sometime bicker amongst themselves to determine the leader. Some ducks are best suited for meat while others prolific egg layers. Some ideal for egg, meat production. Meat birds should weigh at least 4 kg at time of slaughter. Popular meat breeds are Perkin, Cuclairs, Rouen’s and Aylesbury. Perkins are large heavy birds that love to free range. Good egg birds are Campbell and Indian roadrunner. Dual purpose are good for meat and egg production, some are Aylesbury, Saxony’s, Blue Swedish and Muscovy. Others include the Crested, Cayuga’s and Orrington’s. A good reason to start a homestead ducks for eggs farm is because they are easier than chickens. The birds are hardy, require moderate light, food to encourage egg production. People keep ducks for meat, egg or as pets. They are ideal pest control mechanism because the eat mosquitos, insects and larvae. 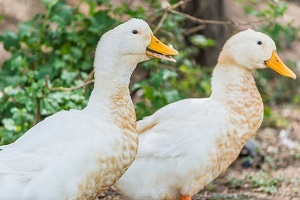 There are a few things to consider before starting a duck farm. Provide housing, bedding, lighting, food. Add watering troughs, perimeter fencing a small pool. Apart from egg production they are good to eat. Other uses are as natural fertilizer, pest control units. They eat bugs, slugs, earthworms, and insects. To farm them you need to acquire the young ducklings. The starter brood depends on what is in mind. To go into meat production buy at least a dozen. Same applies for egg production. If the purpose is for home consumption then purchase four ducks. Source the birds from neighborhood breeder farms. Buy them early summer and you need a source of heat to warm-up the birds. It takes 21 days to raise them in artificial heat environment before they are strong enough to venture out into the field. An interesting practice is to keep chickens and ducks on a farm. Use the chicken to incubate the duck eggs. They are more dedicated at hatching but can manage only 7-8 eggs because of the size. Every morning remove one chicken egg and replace with the duck eggs. Make sure to sprinkle water on the eggs regularly. Most ducks manage to hatch 22 ducklings per season. They need good amount of protein and eat a huge range of food. Protein requirements are 19% layers, 20% young ducklings, 15% adults. Ducks munch on earthworms, vegetables, grains and seeds. Feed insects, fruits, whole grain and dry bread. Others food are rice, onions, commercial duck feed (starter/grower). They are good foragers and eat leafy crops, seedling, snails, caterpillars, slugs, cutworms, fruit flies. Supplement their diet with hard-boiled eggs, duck feed, tomatoes. An adult bird can consume 190 grams of grain. It is important to keep the right ratio of drakes to hens. A single drake can manage two to four hens. Homestead stock could have one drakes (males) and two hens (females). It is best to breed them in pairs or small groups. The females will lay fertilized eggs that are capable of hatching. Make sure they have plenty of water to drink and swim. To encourage hatching you need to provide a shed for them to sleep at night. Add bedding such as hay, straw, wood shavings. The eggs are twice the size of chicken eggs have a rich taste, full of essential minerals, proteins. They are economically viable, attracts premium price in the market. A farmer can sell them twice the cost of a large chicken egg. In some countries they are regarded as a delicacy. 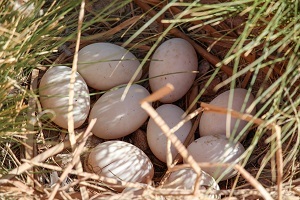 Duck eggs have healthy fat, rich protein while the yolk/shell color is determined by their diet. The eggs have long shelf life can last 7 -14 days without refrigeration. Organic eggs have huge demand and ideal for many culinary applications. The Aylesbury is a highly proficient egg layer and manages 160 to 170 eggs a year. Make sure to collect the eggs when they leave to forage in the mornings. Leave one egg to encourage more egg production. Ducks generally lay eggs early in the morning however during winter they stop laying. The birds will eat earthworms, grains, and insects. Feed the young ducklings commercial grade starter feed. Provide pelted feed, chopped vegetables, fruits. Every living thing is prone to illness and diseases. A common problems are parasites, insect stings, worms. other duck diseases are enteritis, poultry disease and fowl cholera. Ducks live shorter years in the wild than their domesticated counterparts. Domesticated drakes/hens live a considerable number of years in captivity. They can live 10 to 14 years with proper care, housing and feeding. Other determinants are the species, weather conditions, disease and predators. They do not need water to survive but are natural waterfowl, so provide a small pond to keep them happy. They spend a huge amount of time in ponds and use it to clean themselves, hunt insects. Make sure the pond is kept clean by changing the water regularly. Make sure the pond is easily accessible for adults and ducklings. Provide a watering trough, deep bowls outside for them to drink. Housing is important to keep the birds safe. The birds are highly preyed upon by wild animals, hawks, dogs, cats. Therefore adequate security is essential to prevent stock loss. The shelter is ideal for egg production, raising ducklings, sleeping. The shed should be aerated with good ventilation. Provide nesting boxes, wood shavings and litter. Construct a shed, provide perimeter fencing to prevent predators. Make sure the fencing is high enough to keep the birds in and predators out. Use pallets to build a shed to allow airflow and a little moisture into the enclosure. Make the entrance parallel to the ground or provide a small ramp. Some ducks are light weight and have the ability to fly. To prevent loss of stock you need to clip the flight feathers to keep them grounded. Another solution is to keep them in a covered pen or cage. Foraging birds take longer time to add weight than domesticated ducks. Best time for meat production is 70 days. Make sure they are at least 3 to 4.5 kg before slaughtering. Please how much does it cost to hatch duck eggs in Lagos? It takes 26 to 38 days for duck eggs to hatch. The cost depends on the incubation method applied. using an incubation system you need to manage temperature, egg turning, prevent overheating. On the other hand allow natural hatching process. You can see the cost implication has too many variables.